La Rinascita is a historical motor sporting event dedicated to Italian motorcycles, motor scooters and three-wheelers of all brands designed from 1946 to 1962. Therefore also motor vehicles built in 1963, 1964 and 1965. Thanks to these products the Italian people had the opportunity to go to work and enjoy them for leisure. Two days full of meaning especially addressed to the younger generations who must understand how in those difficult and hard years in our country there was a productive and cultural rebirth. 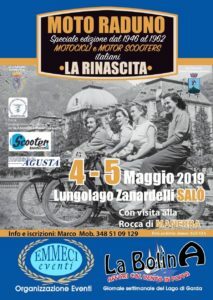 Participants will be able to exhibit their motorcycles on the lakefront of Salò and the neighboring towns. The event will be attended by some Brand registries and foundations such as the AGUSTA Museum and the Scooter and Lambretta Museum as well as a delegation from FB Mòndial. Excursions are planned along the Garda roads with scenic stops. There will be A break in Porto Torchio in the municipal area of ​​Manerba del Garda and a guided tour at the Rocca di Manerba. On Sunday, a trip to Tresnico is scheduled with a stop and an organized picnic.